Central Washington University’s student-run PULSE magazine recently brought home three awards from the National College Media Convention in Louisville, Kentucky. PULSE won seventh place in an on-site “Best of Show” competition for Feature Magazine. Students were competing from among universities from across the nation for this professional recognition. Student Ryan Weier, who graduated spring 2018, won a third-place national Pinnacle Award from the College Media Association and fifth place in the Associated Collegiate Press’ preeminent Pacemaker competition for a feature photo he captured for the story Hammocking 101. The shot took a lot of team work. 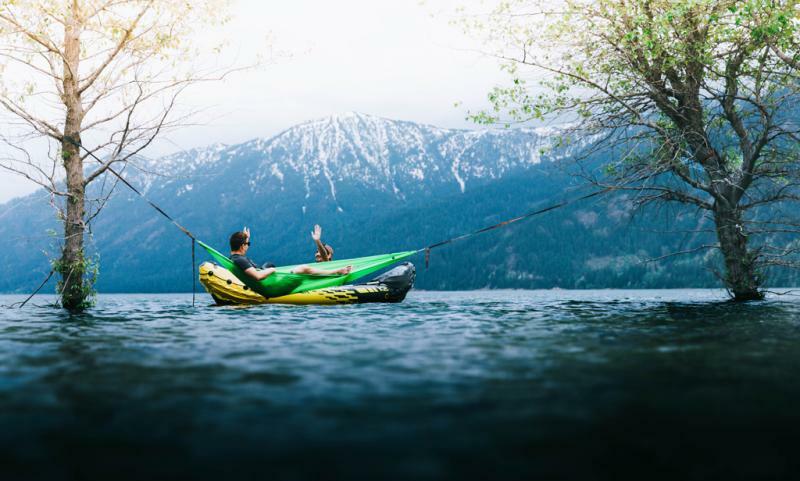 “Ryan captured this photo while chest deep in the water,” recalls current PULSE Director of Photography Zahn Schultz, one of the two students pictured in the photo celebrating a complicated mid-lake hammock set-up. “We were trying to beat an incoming thunderstorm and we knew we couldn’t lose this shot. I paddled Josh out in the raft so he could climb the trees to tie the straps, then carefully to the middle so he could get in the hammock. It took a few tries,” Schultz said. Wicks, Schultz, PULSE Creative Director Matthew Conrardy and PULSE Assistant Editor Anakaren Garcia traveled to the convention over the weekend. Jennifer Green, PULSE faculty adviser and a senior lecturer in the Department of Communication Studies, added: “These and the many other awards PULSE students have won are gratifying because they recognize the range and evolution of the magazine as well as the team work, effort and creativity of the successive student staffs over the years." The campus and community celebrated the magazine’s 50th issue and recent awards at a party at the Student Union and Recreation Center on Wednesday. An article in the new Fall 2018 issue, now on stands in Ellensburg, details highlights from the last 10 years and 50 issues of PULSE. Launched in the communication studies department in fall 2008 as a website, PULSE became a quarterly online flip-through magazine in winter 2011, a twice-quarterly publication in fall 2011, and has been available in print since spring 2015 with support from Student and Activities funding. Among the more than two dozen national, regional and campus awards PULSE students have won over the last six years are recognition for everything from investigative stories to hand-drawn illustrations, sports and feature stories to diversity coverage and PULSE’s website, graphic designs, photographs, videos, multimedia pieces, podcasts and the magazine as a whole. All past PULSE issues are available on the magazine’s website at www.cwupulsemagazine.com. For more information, about PULSE magazine or the Department of Communication Studies contact Jennifer Green at Jennifer.Green@cwu.edu. The Department of Communication at CWU offers Digital Journalism degrees in broadcast and writing & reporting. CWU boasts modern broadcast facilities where students can practice every aspect of broadcast and audio production, and labs equipped with the latest editing and design software used in professional newsrooms. Journalism degrees are built on hands-on experience covering real news that’s published across a variety of platforms under the guidance of experienced faculty and staff. Media Contact: Dawn Alford, Public Affairs, 509-963-1484, dawn.alford@cwu.edu.